Poison Skies are an Auckland based high-energy rock five-piece, who have quickly become known for their carefully-crafted, hook-laden, uncompromising rock. With their three singles, Victim of Reality, City Streets and Eighty-Six (over 60,000 YouTube views) getting radio-play throughout the country the lads are looking forward to releasing their debut EP Day To Defy” due 24th of October. 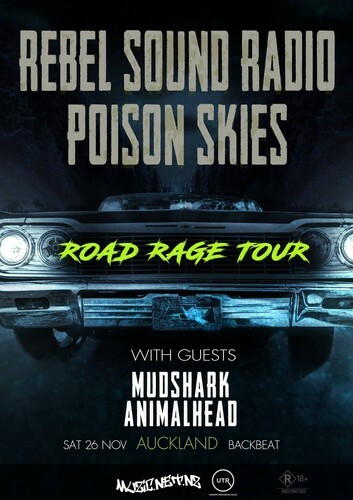 Poison Skies are amping up to deliver their critically acclaimed high-octane live show throughout the North Island in November 2016. Rebel Sound Radio were formed early 2015 in Hamilton New Zealand, a sleepy riverside city that has given birth to some of New Zealand's biggest artists. The wild three piece and set up shop writing and moulding their new found rock and roll sound drawing influence from both classic and modern rock. Rebel Sound Radio are also releasing their debut EP (Regret Nothing) 24th of October. Both bands EP's have been recorded and mixed with Tui award-winning engineer Dave Rhodes of Depot Studios, Devonport, Auckland. Mudshark have been together for as long as a piece of string. Fusing rock, pop, metal and funk. The name says it all, don't miss out on seeing this class act. AnimalHead 3 piece hard rock act from Auckland have a unique blend of serious guitar riffage with all sorts of drum action ready to fill your ear holes. After recently competing in the Ding Dong Lounge Bands Competition along with Mudshark also these guys are ready to rock.